Planning a little space travel to see some friends on Kepler 22b? Thinking of trying out your newly-installed FTL3000 Alcubierre Warp Drive to get you there in no time? Better not make it a surprise visit — your arrival may end up disintegrating anyone there when you show up. While many factors involving FTL travel are purely theoretical — and may remain in the realm of imagination for a very long time, if not ever — there are some concepts that play well with currently-accepted physics. 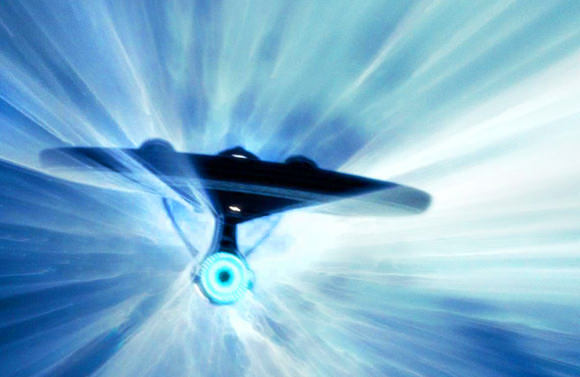 The Alcubierre warp drive is one of those concepts. Proposed by Mexican theoretical physicist Miguel Alcubierre in 1994, the drive would propel a ship at superluminal speeds by creating a bubble of negative energy around it, expanding space (and time) behind the ship while compressing space in front of it. In much the same way that a surfer rides a wave, the bubble of space containing the ship and its passengers would be pushed at velocities not limited to the speed of light toward a destination. Of course, when the ship reaches its destination it has to stop. And that’s when all hell breaks loose. Researchers from the University of Sydney have done some advanced crunching of numbers regarding the effects of FTL space travel via Alcubierre drive, taking into consideration the many types of cosmic particles that would be encountered along the way. Space is not just an empty void between point A and point B… rather, it’s full of particles that have mass (as well as some that do not.) What the research team — led by Brendan McMonigal, Geraint Lewis, and Philip O’Byrne — has found is that these particles can get “swept up” into the warp bubble and focused into regions before and behind the ship, as well as within the warp bubble itself. When the Alcubierre-driven ship decelerates from superluminal speed, the particles its bubble has gathered are released in energetic outbursts. In the case of forward-facing particles the outburst can be very energetic — enough to destroy anyone at the destination directly in front of the ship. In other words, don’t expect much of a welcome party. Another thing the team found is that the amount of energy released is dependent on the length of the superluminal journey, but there is potentially no limit on its intensity. So how to avoid disintegrating your port of call? It may be as simple as just aiming your vessel a bit off to the side… or, it may not. The research only focused on the planar space in front of and behind the warp bubble; deadly postwarp particle beams could end up blown in all directions! Luckily for Vulcans, Tatooinians and any acquaintances on Kepler 22b, the Alcubierre warp drive is still very much theoretical. While the mechanics work with Einstein’s General Theory of Relativity, the creation of negative energy densities is an as-of-yet unknown technology — and may be impossible. Which could be a very good thing for us, should someone out there be planning a surprise visit our way! Read more about Alcubierre warp drives here, and you can download the full University of Sydney team’s research paper here. Thanks to Brendan McMonigal and Geraint Lewis for the extra information! Main image © Paramount Pictures and CBS Studios. All rights reserved.